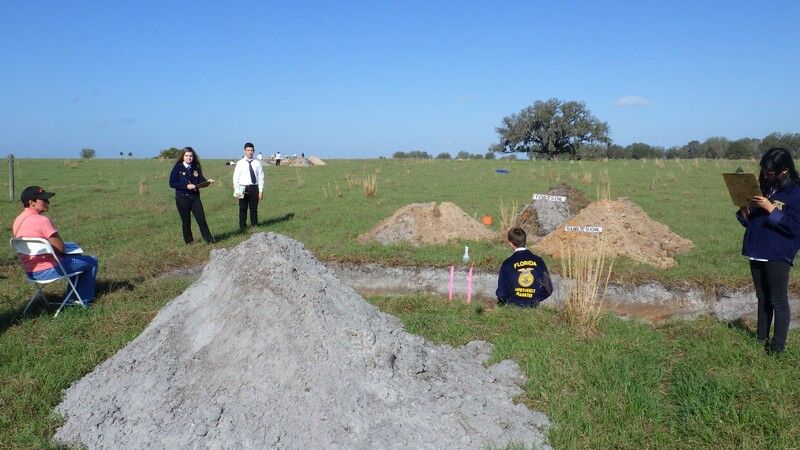 The annual land judging competition sponsored by the Manatee River Soil and Water Conservation District was recently held at Ed Chance Reserve-Gilley Creek Tract. Students answered test questions concerning soil properties at four fields in such categories as slope, depth, texture, permeability, erosion, and nutrients. One of the fields represented a potential homesite location, and students were questioned on how well the land could serve as a building site. Savannah Cannon, FFA student from Lakewood Ranch High School, won the I.H. Stewart Award with the highest individual overall score, sponsored by ECo Consultants and presented by Alec Hoffner. All middle school FFA teams competing were from Buffalo Creek Middle School. The team composed of James Keen, Eric Gramby, Brandon Rowe, and Amber Hansen won the Callon Keen, Sr. Award for the team with the highest score overall, sponsored by members of the Keen family. A middle school team placing first overall in this competition is quite remarkable and is to be commended. James Keen, with the highest score on the winning team, is the great grandson of Callon Keen, Sr., namesake of the award. His grandfather Callon Keen, Jr. (Buddy) and parents Jimmy and Holly Keen presented the award to the team. 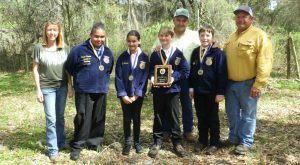 The team from Buffalo Creek Middle School also won the middle school FFA division and the Travis Seawright award established last year to recognize the top scoring middle school team. Jimmy Keen, a Manatee County Land Judging alumnus, presented the Seawright award sponsored by the Manatee County Land Judging Alumni. The second place middle school FFA team, included students Cara McLeod, Braden Connors, Hannah Weltzien, and Brayden Wright. In third place, were Hayden Neuman, Aidyn Reynolds, Brandon O’Brien, and Ella Walker. Steve Harber advised all Buffalo Creek Middle School FFA students. In the high school FFA division, the winning team was from Southeast High School advised by Mike Buckley, with students Kyle Evans, Julian Cruz, Odalyz Morfin, and Hao Le. Placing second in the FFA high school division was a team advised by Janyel Taylor from Lakewood Ranch High School, with students Savannah Cannon, Isabelle Chamness, Alyssa McKinney, and Kora Turner. 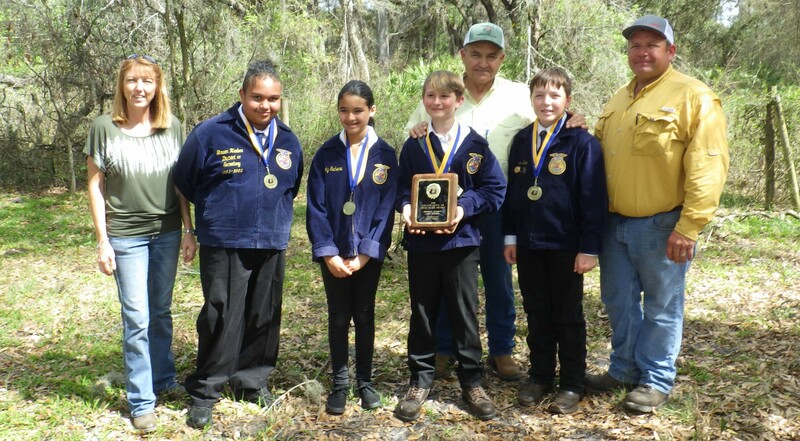 A FFA high school team with students Alyssa Pritchett, Caissy Chase, Zachary Stolze, and Hailey Mahoney taught by Julie Tillett from Palmetto High School placed third. Placing first for 4-H seniors was a team including Colton Ginter, Jo Hoffner, and Jay West. 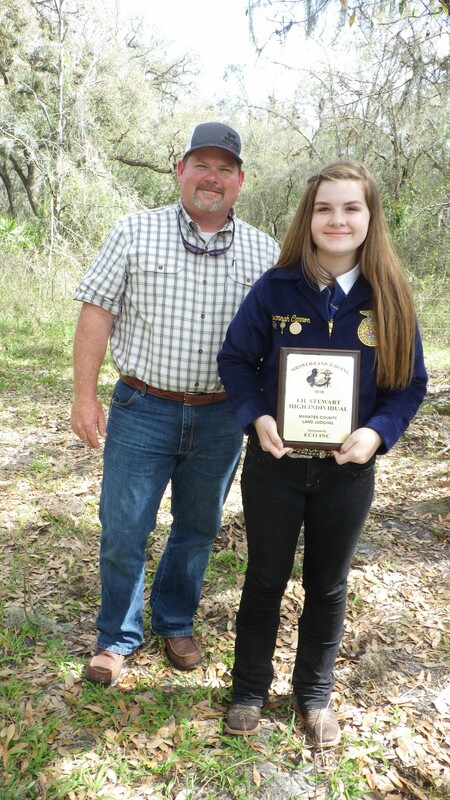 First place junior 4-H individual was Emma Albert. All 4-H students were advised by Alec Hoffner of ECo Consultants. Martin Figueroa, NRCS Senior Soil Scientist served as Chief Judge. Two Manatee River Soil and Water Conservation District supervisors attended, with Paul Howard serving as a hole monitor and also presenting awards along with Buddy Keen. Lunch was provided and prepared by Doug Wilbanks and Bart Hoopingarner representing Syngenta and Gowan, respectively. Manatee County Cattlemen’s Association kindly provided tables and chairs for the lunch. After the contest the Chief Judge reviewed the results with the students. ← Let us help you with your fertilizer or pesticide license!